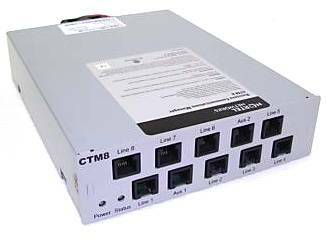 The Nortel BCM CTM8 (analog station) media bay module can connect to a maximum of eight analog telecommunication devices. Devices include standard analog telephones, cordless telephones, fax machines, answering machines, or modems (maximum speed for a modem connection is 28.8 kbit/s). The BCM-CTM 8 connects up to eight analog CLID PSTN lines to the BCM system. Two auxiliary ports permit the connection of a 33.6+ Kbps modem, fax machine or single line analog telephone to line 1 or 5. When the auxiliary device is using line 1 or 5, the BCM system does not allow other telephones to use line 1 or 5. When a single line analog telephone is connected to the auxiliary port, it can be used as an emergency telephone.